With the given title from Yori, my mind digged the previous works and pressed my creative juices. Posted in Poetry, Rhyme / Rhythm and tagged Abba, Attitude, beauty, Beware, Bible, Bind, Choice, Christ, Contract, Creator, decision, Father, Future, God, Heal, Heart, Heavenly, Holy, Immanuel, Inner, Jesus, Lord, Messiah, Mindset, Misunderstanding, Poetry, Rhythm, Saviour, Scripture, Son, Spirit, Thinking, Trap, Word, Wound. Bookmark the permalink. involving abuse of confidence; deceitfully manipulative: a con trick. to persuade by deception, cajolery, etc. Li>a confidence game or swindle. a lie, exaggeration, or glib self-serving talk. 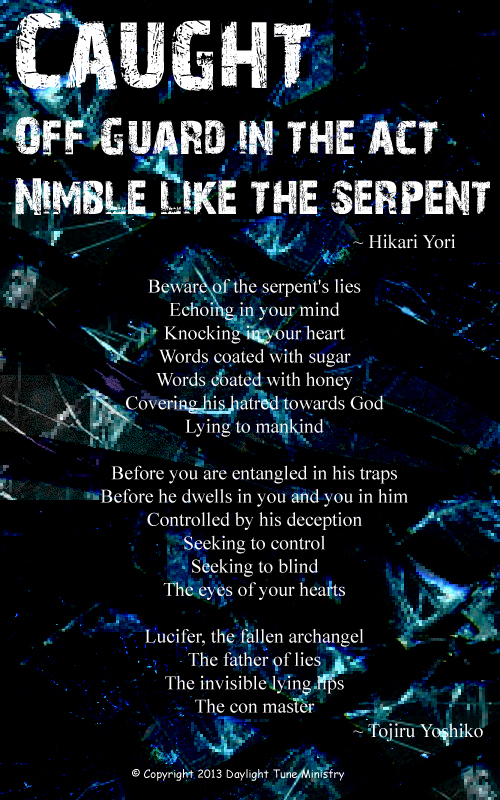 Yori’s acrostic poetry gave me the visual idea of the devil’s deception described by Jesus in the book of gospel. After communicating with Yiri cia email, inspirations flowed out as I continued writing it down. 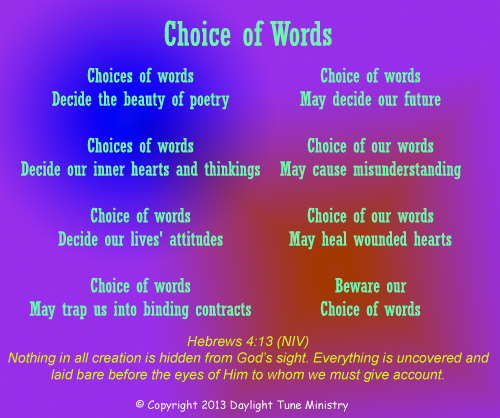 Posted in Acrostic, Poetry, Rhyme / Rhythm, Simile and tagged Abba, Act, Bible, Blind, Caught, Christ, Con, Creator, Deceive, Deception, Entangle, Eyes, Father, God, Guard, Hatred, Heart, Heavenly, Holy, Honey, Immanuel, Jesus, Lies, Lip, Lord, Master, Messiah, mind, Nimble, Off, Saviour, Scripture, Serpent, Son, Spirit, Sugar, Swindle, Trap, trick, Word. Bookmark the permalink. My friend confided that her tissue roll was wet because her mother in law asked. This question continually lingered in her and scratching her head. Then she realised the angle of the shower head was facing towards the tissue roll. No wonder this turned the dry tissue to wet tissue. Hoping that I will express it in poetry for her and to see my conclusion and inspiration. Posted in Metaphor, Poetry, Simile and tagged Analyse, Bible, Blind, Christ, Compass, Conclude, Confide, Creator, Detective, Downhill, Dry, Fall, God, Guide, Head, Holy, Jesus, Lord, Metaphor, open, Poetry, Roll, Scripture, Shower, Simile, Sin, Son, Spirit, Tissue, Trap, Wet, wonder, Word. Bookmark the permalink. The word “devious” from Proverbs 2:15, “Whose paths are crooked, and who are devious in their ways” sparked my imagination. It began with, “Envious Devious” rhyming in my mind. But the poetry flowed out on Friday midnight. Posted in Poetry, Rhyme / Rhythm and tagged avoid, Aware, Beware, Bible, Devious, Envious, Envy, Poetry, proverbs, Rhyme, Scripture, Trap. Bookmark the permalink. Who wants us to suffer with him in the abyss of fire. 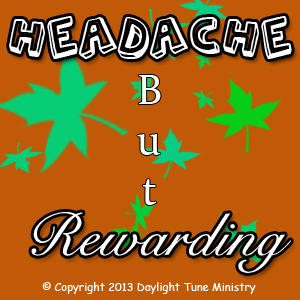 “HR”, “HDR”, “Headache Rewarding” then “Headache But Rewarding” inspired me, while I was caressing my son to sleep. It was like the acronym then the definition came. Though taking care of my child is draining me, sometimes I feel rewarding whenever I was reminded of my family and friends told me that. HR stands for Human Resource department in the corporate world who are in charge of employing people. HDR stands for High Dynamic Range photography refers to the range of brightness levels that exist in a particular scene – from darkest – before complete and featureless black, to lightest – before complete featureless white according to http://www.luminous-landscape.com/tutorials/hdr.shtml. Posted in Acrostic, Poetry and tagged Abyss, Adulthood, Baby, care, child, children, Christ, Creator, Destruction, devil, Dynamic, evil, family, Fire, Friends, God, HDR, Headache, High, Holy, HR, Human, Inner, Jesus, Lord, Obedience, Obligation, Outer, Prevent, Range, Resource, Rewarding, Son, Spirit, suffer, Tasks, teenager, Toddler, Trap. Bookmark the permalink.